Taylor 300 series guitars are all solid wood guitars that come with either Mahogany or Spruce tops. The 2016 models see the introduction of Tasmanian Blackwood for the back and sides of some models. The prices for the 300 series range from 1,658 (USD MSRP) to 2,638 (USD MSRP) depending on the model. Though MSRP (Manufacturer’s Suggested Retail Price) is rarely the price you actually pay when it comes to guitars so you should expect to pay less. I will list some more realistic “actual” prices for these guitars at the end of this post. There are 23 different models in the 300 series (plus a couple of Nylon string options but I won’t be covering those here). Of course there are similarities between all of them – or they wouldn’t be part of a series! But it does mean that you can get pretty much every option with or without a cutaway, with or without electronics and in a variety of different shapes/sizes. Some models also come in a 12-fret model (where the neck joins the body at the 12th fret, as opposed to the norm of joining at the 14th fret). Before we take a look at the guitars individually, let’s take a look at the names. This can make it quicker and easier to understand the differences between each guitar. The second number indicates the type of guitar and the top wood used. We’ll cover more of these features when we look at the individual guitars, which we’ll do right now! All MSRPs are in USD. Starting out with the dreadnoughts and starting with the most basic model, let’s take a look at the 310. 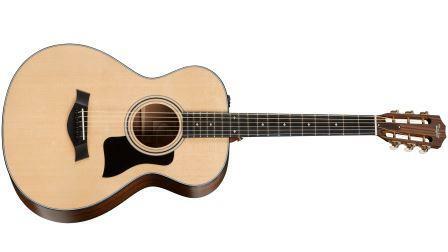 Taylor’s 200 series and 100 series use laminate wood back and sides. 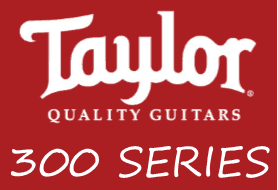 The 300 series is the first entry point for all solid wood in Taylor’s range. 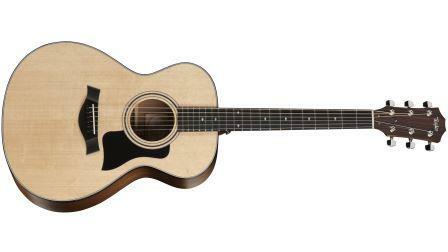 The 300 series now also features a slightly shorter scale length and slightly wider nut width than the 200 and 100 series dreadnought guitars. There have been some minor changes for the 2016 model compared to the 2015 model – the most significant being that the 2015 model’s scale length was 25 ½” (648mm). It also has a slightly different look to it with a medium brown stain finish, in place of the no stain finish on the 2015 model. As you can probably guess, the 310e is pretty much the same guitar as the 310 except that it is fitted with Taylor’s Expression System® 2 electronics. This of course adds to the cost. 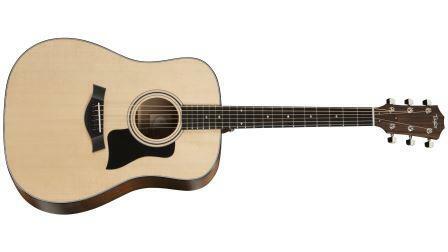 This is the model of choice if you’re after a Sitka Spruce top/Sapele back & sides, dreadnought with electronics but no cutaway. 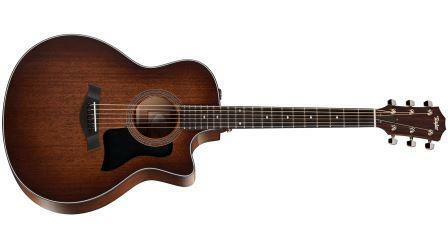 The 310ce is the same as the 310e except that it has a Venetian Cutaway. O.k. I think you’re getting the idea here! Next let’s take a look at the Grand Concert and the Grand Auditorium models with Sitka Spruce tops and then we’ll take a look at the lookers (in my opinion) – the Tropical Mahogany topped models. The first of our Grand Concert models is the 312. The only major difference between this and the dreadnought model is the shape. But that is a major difference and will significantly effect the tone and feel of the guitar. The sound will be “smaller” and more balanced compared to the dreadnought and is suited to guitarists who like to play a lot of fingerstyle (as opposed to the dreadnought which is more suited to flat-picking and strumming). The size of the guitar, the scale length and the lighter gauge strings also make this guitar easier to play and make it well suited for beginners too – albeit beginners with a decent sized budget! You can see the size difference between the Dreadnought, Grand Concert, Grand Auditorium and Grand Symphony in the table below. You guessed it! This is the 312 but with the Expression System® 2 electronics. You guessed it again – this version is the 312 but with the Expression System® 2 electronics and a Venetian Cutaway. The 312e 12 Fret is the first of the 12 fret models we are looking at. This just means that the neck joins the body at the 12th fret. Once upon a time this was the norm for acoustic guitars but in this day and age most acoustic guitars have the neck joining the body at the 14th fret. What this also means is that the 312e 12 Fret has 18 total frets, as opposed to the 20 total frets on the 14 fret models. The 12 fret model also has another major difference. The position of the bridge is shifted further from the soundhole than on the 14 fret model. So the scale length stays the same (24 7/8) but the bridge is more towards the base of the body. This gives the guitar a unique sound and a softer feel to play. The change in sound largely comes from the fact that the top vibrates differently. Otherwise, this model is the same as the 312e except for some minor differences – like the tuning pegs being a different type. The 312ce 12 Fret is the same as the 312e 12 Fret except that it has a Venetian Cutaway. Now we come to the first of the Grand Auditorium models. The major difference between this and the Dreadnought and Grand Concert models is, of course, the difference in body shape. The Grand Auditorium is the great balance between the Dreadnought and the Grand Concert shape. 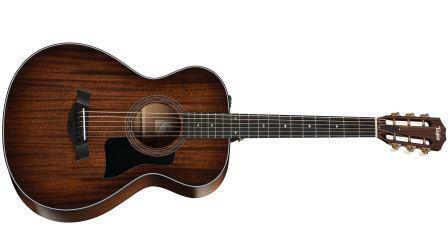 It’s ideal for anyone who shifts between strumming, flat-picking and finger-picking often. It can do all 3 well. It’s the great all-rounder shape. It has a body that is almost as large as the Dreadnought – as you can see in the table below, it has the same body length and lower bout width. 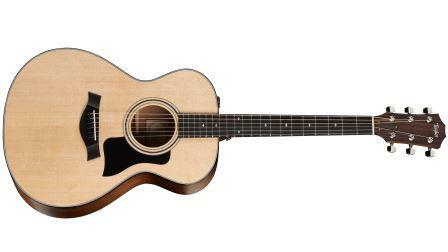 The major difference in the shape is the narrower waist, which produces a more mid-range heavy, balanced tone that is less boomy than the dreadnought. The 314e is the 314 except fitted with Taylor’s Expression System® 2 electronics. 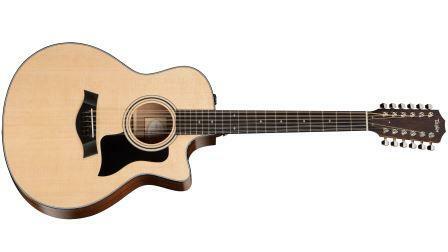 The last of the Sitka Spruce topped models, and the first of the 12 string models is the 356ce. It’s a 12 string guitar! Now we get into the Tropical Mahogany top options. In my opinion these guitars look amazing this year! They have a new medium brown stain with shaded edge Burst finish that, in my opinion, looks streets ahead of the 2015 model. But beauty is of course in the eye of the beholder. The Tasmanian Blackwood back and sides is also a change from the 2015 model, which had Sapele back and sides. 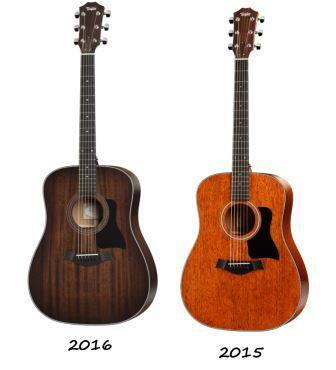 I haven’t played the 2015 and 2016 models side by side so I’m not sure what difference there is in sound (which would be mostly from the new back and sides) and the feel (which would come mostly from the shortened scale length) but it does make for a strikingly different appearance, as you can see in the image below. I definitely prefer the new look – what do you prefer? This is the 320 with the Expression System® 2 electronics fitted. The 322 models are essentially the Grand Concert Versions of the 320 models. The 322 has no cutaway or electronics. The 322e has electronics but no cutaway. The 322ce has electronics and cutaway. I had the privilege recently to play the 322e and I loved it. You can check out my full review of that model at the link below. 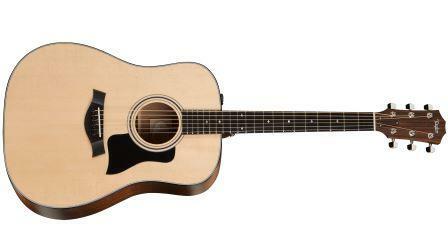 The 322e and 322ce also come in 12 fret models. The 322e 12 Fret is essentially the 12 fret version of the 322e. The 322ce 12 Fret is essentially the 12 fret version of the 322ce. See the 312e 12 Fret above for details on the differences between the 12 fret models. These are the Grand Auditorium versions of the 320 series. Or you could look at them as the Mahogany top/Blackwood back and sides versions on the 314s. Like the 314s the 324s have the 25 ½” (648mm) scale length as opposed to the 24 7/8” (632mm) scale length on the Dreadnought and Grand Concert Models. The 326ce has the Mahogany Top/Blackwood back and sides like the other “32” models. But it is in the Grand Symphony shape. 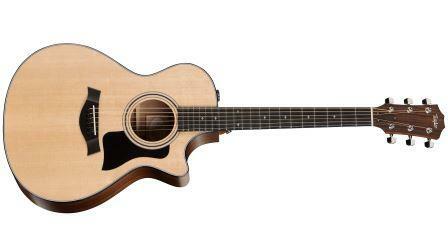 This is the only 6 string model in the Grand Symphony shape and the only Mahogany model in the Grand Symphony shape. The only other Grand Symphony model in the 300 series is the 356ce (12 string with Sitka Spruce top – see above). You can see the difference between the different Taylor shapes in the table below. It comes with electronics and with a cutaway. It has a 25 ½” (648mm) scale length but is otherwise very similar to the 320, apart from the body shape. Finally we come to the 360e. 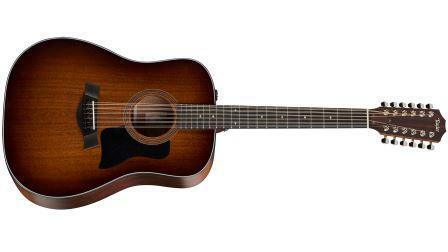 This is the only 12 string dreadnought in the 300 series and also the only Mahogany Top 12 string. The following is based on some quick research into the prices that you are more likely to pay for each model. 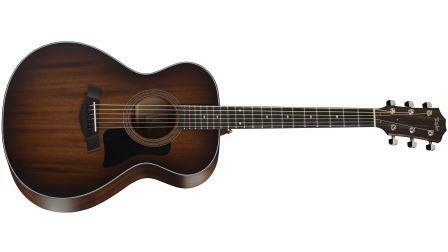 I hope you now know more about the Taylor 300 series of acoustic guitars and whether any of these are suited to you or within your budget. I’ve had the privilege of playing a couple of these guitars and they sound amazing and feel really nice to play. You can check out my full review of the 322e at the link below.